Recent discoveries have revealed just how volcanic Antarctica really is, despite being hidden underneath massive ice sheets. However, up until now, there remained significant debate as to what is causing the unusual amount of volcanic activity under an area covered in ice. Recent research found the source of magma that is fueling the volcanoes underneath Antarctica. The source, a massive upwelling of mantle magma, also known as a hotspot. This is a similar mechanism that produced the Hawaiian Islands and fuels volcanic and geothermal activity in Yellowstone. There were two key reasons this discovery was difficult to come by, despite significant research. The first is the difficulty of measuring anything underneath kilometers of ice. Typically geoscientists gain a better understanding of the Earth’s inner workings by sending sound waves into the ground and measuring the time and angle at which they return to the surface. Using complex mathematical algorithms, geophysicists are able to reconstruct a three-dimensional picture of the subsurface. However, this was difficult to do when any acoustic signal has to travel through kilometers of chaotic ice, causing significant noise in the subsurface “picture” beneath Antarctica. The second is the counterintuitive nature of having a massive heat source underneath an area that is covered with kilometers of ice. With an average ice sheet thickness of 2.16 km and a maximum thickness of around 4.7 km, it’s hard to believe there is a massive heat source similar to the one in Yellowstone sitting beneath the ice. How has the heat source not prevented ice build up? To tackle these questions the research team used a numerical model to help constrain the heat required to produce the melting we currently measure in Antarctica. While direct measurements underneath Antarctica are difficult and few, there are numerous measurements of meltwater outflow. This allowed the research team to constrain their model. Depiction of the water pathways under the Antarctic ice sheet. Blue dots are lakes, whereas lines show rivers. Marie Byrd Land, the source of the mantle plume, is located near the Antarctic Peninsula. It is well known that there are rivers and lakes beneath Antarctica that drain meltwater to the ocean. Some lakes are as large as Lake Erie and can rapidly drain into the ocean, causing a sudden sinking of the overlying ice. The numerical model, using constrained melt rates, were able to predict heat sources underneath Antarctica. 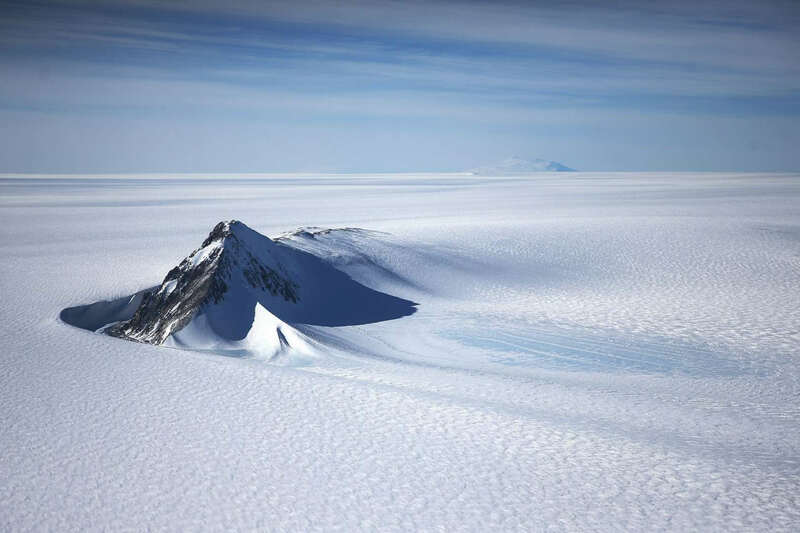 The team found that the heat coming from beneath Antarctica is constrained to 150 milliwatts per square meter, with a higher heat rate causing too much melting as compared to what is measured. To compare that with other areas, the average heat flux from the Earth is 40-60 milliwatts per square meter and it reaches an average of 200 milliwatts beneath Yellowstone National Park. Interestingly, the team found one location where the heat flow required jumped to 150-180 milliwatts underneath Antarctica. This area is the presumed source of the massive mantle upwelling and heat source. The Marie Byrd Land mantle plume appears to be the primary driver of volcanic activity in Antarctica. Geologists believe the mantle plume formed 50 to 110 million years ago when Antarctica was not covered in ice. Since then, the mantle plume has continually worked to heat up Antarctica, continually working to melt the overlying ice.